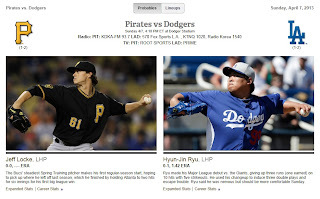 PennsylvAsia: Pirates get Hyun-Jin Ryu's second MLB start on Sunday. 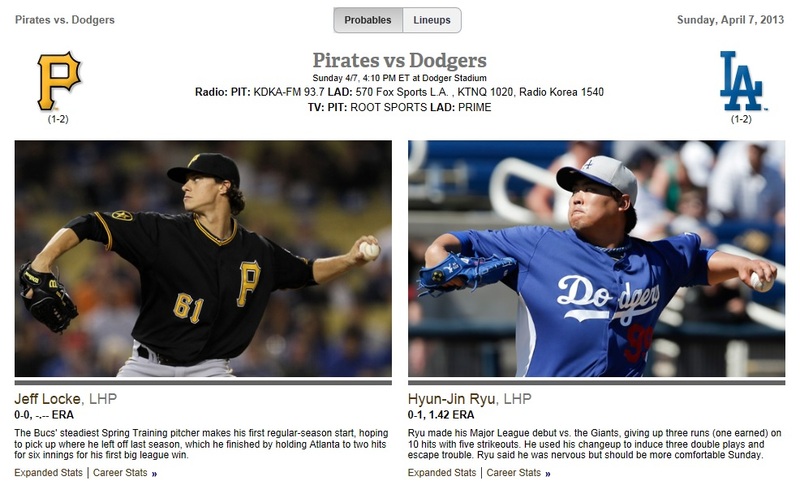 Pirates get Hyun-Jin Ryu's second MLB start on Sunday. The Korean press had long been speculating when star pitcher Hyun-Jin Ryu would make his Major League debut. In January, the Hankook Ilbo, among others, forecast it for April 6th or 7th against the Pittsburgh Pirates. They got it half right: Ryu will pitch April 7 against Pittsburgh, but it will be his second start. He lasted 80 pitches (and endured poor play from his infield) in his first start, taking the loss on April 2. The Pirates were one of many MLB teams scouting Ryu when he pitched for Hanhwa, but the high posting fee and Pittsburgh's commitment to losing led him elsewhere.